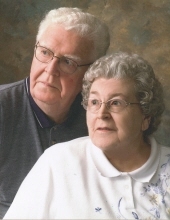 Diane A. Tate passed away on Wednesday, March 27, 2019at Rennes Health Center-De Pere. She was born June 24, 1937 to Alfred and Agnes Kopetzki in New Ulm, Minnesota. Diane graduated from Holy Trinity Cathedral and St Gabriel’s School of Nursing. On July 15, 1961 she married Richard A. Tate in New Ulm, Minnesota. Diane was employed on the 4th floor at St. Vincent Hospital for 25 years. She is survived by her husband Richard; four children: Michelle McLean, Scott (Karen), Mark (Lisa), and Shawn (Shelly); eight grandchildren: Jordan, Taylor, Stephanie (Jared), Logan, Michael, Bryce, Brandon, and Brianna. Diane is further survived by her two brothers: James (Arlene) Kopetzki and Steven (Marlene) Kopetzki both of Minnesota. She was preceded in death by her parents and an infant brother. Family and friends may visit on Tuesday, April 2, 2019 from 4:00 to 7:00 PM at Our Lady of Lourdes Parish, 1306 Lourdes Ave, De Pere. Visitation will continue at the church on Wednesday, April 3, from 9:00 to 10:30 AM. Mass of Christian Burial will follow at 10:30 AM at Our Lady of Lourdes Parish with Fr. Benny Jacob, O. Praem. officiating and Deacon Mike Vander Bloomen assisting. Please visit www.ryanfh.com to send condolences to Diane’s family. In lieu of flowers, memorials are appreciated for a memorial fund to be established. Diane’s family cannot express enough gratitude and thanks to Unity Hospice and Rennes Health Center; your care and support will not be fogotten. To send flowers or a remembrance gift to the family of Diane A Tate, please visit our Tribute Store. "Email Address" would like to share the life celebration of Diane A Tate. Click on the "link" to go to share a favorite memory or leave a condolence message for the family.